First Lady of Kansas, Mary Brownback, and author of Life in a Jar, Jack Mayer, pose as Mr. Mayer receives the Notable Book Award. Life in a Jar author, Jack Mayer, at the Governor’s Reception for Notable Books in Topeka, KS. 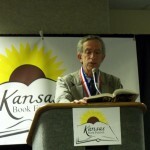 Jack Mayer speaks at the Kansas Book Festival in Topeka, KS on September 24, 2011. 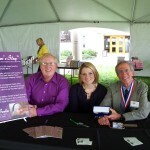 Educator, Norm Conard, Irena Sendler Project member, Jaime Walker Berndt, and author Jack Mayer, sign books. 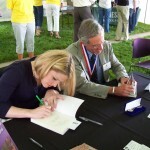 The book signing at the Barnes and Noble tent, at the Kansas Book Festival, shows Life in a Jar cast star, Jaime Walker and author Jack Mayer. 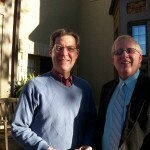 Governor of Kansas, Sam Brownback, visits with Life in a Jar author, Jack Mayer of Vermont. 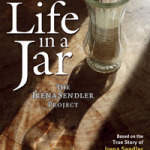 Life in a Jar/the Irena Sendler Project book signing at the Kansas Book Festival in Topeka. 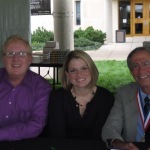 From left to right, Norm Conard, teacher of the project, Jaime Berndt, one of the cast members, and Jack Mayer, the award winning author. 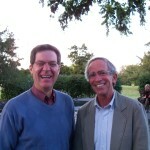 Governor of Kansas, Sam Brownback, visits with educator, Norm Conard, at the Kansas Book Festival Reception. Star of the Life in a Jar performance, Jaime Walker Berndt, with Life in a Jar author Jack Mayer. 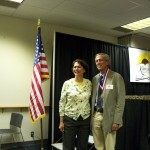 Mr. Mayer received the Notable Book of Kansas Award from the First Lady of Kansas. 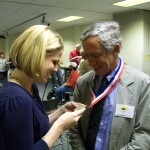 Life in a Jar cast member, Jamie Walker Berndt, admires the medal received by author Jack Mayer. 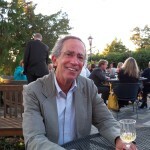 The award was presented at the Notable Book Awards in Topeka, on September 24, 2011.